Many garden and boundary walls are created using inexpensive cement blocks. Unfortunately, while economical, these blocks are susceptible to being damaged by the elements, and many of the walls built with them begin to crumble and appear dilapidated. Once you have been assured by an expert that the entire wall does not need to be rebuilt, you can use a few simple supplies and some easy steps to make your wall perfect again in just one long weekend. Cement block walls can be repaired. Wear appropriate clothing that will protect your skin from flying cement. Completely cover your limbs and choose thick or steel-toed boots to guard your feet against falling pieces of cement. Wear goggles to protect your eyes and work gloves to protect your hands. 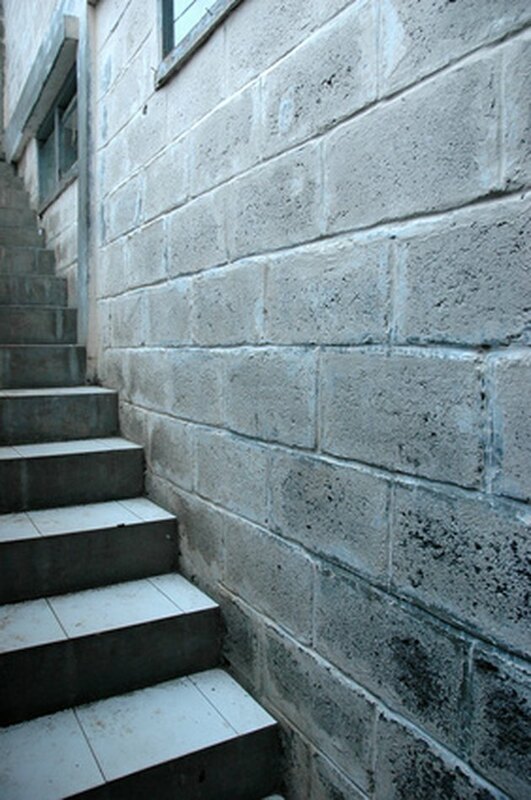 Scrub the crumbling areas of the wall gently with a stiff-bristled brush to knock away small, loose pieces of cement. Use a clean paintbrush to make sure that the entire area is free of cement dust and other debris. Place two large cement blocks tightly against the wall underneath the area to be patched. Lay a scrap board over the blocks to provide a surface that will catch any cement patch that falls so it can be scraped up with a trowel and reused, rather than ruining the surface below the wall. Transfer the dry cement patch product to a bucket and add the amount of water indicated on the package. Mix with a shovel until the consistency is a bit looser than toothpaste. Dampen the area that you want to patch using a garden hose with a fine-mist attachment or a fine-misting spray bottle. Add a generous application of the prepared cement patch to the crumbled area with a metal trowel until the patch is built up evenly with the undamaged wall around it. Carefully smooth the surface of the patch with the flat face of the trowel. Turn the trowel to a 45-degree angle and use the edge to scrape away excess patching material. Allow the patch to cure for two hours. Pat or rub over the set patch material with a scrap piece of lumber so that it has a similar texture to the older cement and does not stand out. Repeat the process to fill other crumbling areas. Cover each patch gently with heavy plastic wrap and allow to cure for three days before removing the plastic.